ICT Indicators are critical to the understanding of the status of ICT development in a country. They can also serve as benchmarking tools to allow relative assessment of development progress in comparison to others. 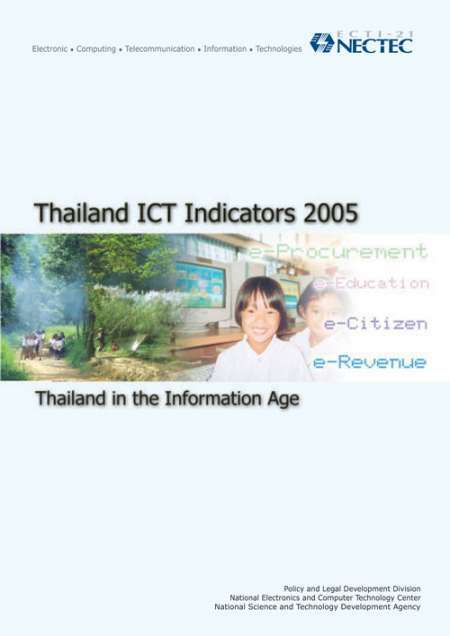 When our first endeavor in gathering ICT-related statistics, Thailand ICT Indicators Series I, was published in 2003, we did not anticipate that our book would stir such a huge demand. As it turned out, we received positive and enthusiastic responses as well as comments locally and internationally. This reaffirms our belief that there is a need for a country to have systematic mechanisms in collecting as well as disseminating ICT indicators on a continual basis. ICT Indicators are critical to the understanding of the status of ICT development in a country. They can also serve as benchmarking tools to allow relative assessment of development progress in comparison to others. Furthermore, they can be used as impact assessment tools to monitor ICT roles in economic and social development. Without relevant statistics, we cannot conduct objective assessment on the ICT situation of the country. During the past two years (2003 - 2004), our research team at the National Electronics and Computer Technology Center (NECTEC), Ministry of Science and Technology, has worked closely with the National Statistical Office (NSO), Ministry of Information and Communication Technology, in an endeavor to study, collect, and analyze several ICT-related statistics from many agencies in order to come up with a list of core ICT indicators to be gathered on a continual basis. In gathering these ICT-related statistics, serveral approaches and methodologies were used. On the demand side, the NSO and NECTEC developed survey questionnaires related to ICT ownership and usage in 2001. These questionnaires were used as supplementary and were integrated into regular surveys, such as household and business establishment surveys. In early 2004, however, the NSO launched full scale IT surveys on household and business establishments, aiming to produce several baseline indicators. On the supply side, the statistics used are mainly from telecommunication operators as well as business associations such as ATCI (the Association of Thai Computer Industry). Additionally, NECTEC has initiated a few other mechanisms to generate a set of ICT-related statistics which can be used as indicators to monitor the status of Thailand ICT development. We would like to highlight a few examples as follows: • NECTEC conducts an online survey of Internet users on an annual basis to study their profiles. The questionnaire is posted on NECTEC web site and at least five more popular ones around September-October each year. The number of respondents has been increasing every year, up to more than 15,000 for the past two years. • To complement with Thailand initiatives on e-Government, NECTEC has launched a readiness survey on government web-based services, whereby government agencies were asked to assess their ability to provide different types and levels of e-Services via the designated web site. • NECTEC has developed an advanced web statistics service called “Truehits” (http://truehits.net) which receives cooperation from more than 7,000 website owners. The statistics generated by ”Truehits” can be used to monitor Internet users behavior-where and when they visit the web site. Through this, we are able to speculate the kind of web sites which were most frequently visited. Considering the statistics presented in this book, there are notably three approaches in their selection. Firstly, we add the latest figures available to update the data presented last year, such as the telephone penetration. Secondly, we include the newly released figures, such as the ICT penetration among business establishments. Lastly, we decide to leave out figures, derived from a one-off survey, which were presented in the previous series. For those who are interested in the first series, the soft copy is available on our web site (www.nectec.or.th/pld/document/indicators2003.pdf). Well, there is a common saying “a picture paints a thousand words”. We believe figures and statistics hold the same truth. The infrastructure-related statistics show the prevalent digital divide in Thailand. Notwithstanding the government intervention to bridge the gap, it appears that people who live, learn, and work in the rural areas are socially and economically disadvantage. The intensity and sophistication of usage, however, are more difficult to evaluate. Included here are statistics on, for example, the average online time, the kind of activities people conduct on the Internet, and the type of web sites frequently visited. The rate to which ICT was integrated into the Thai economy can also be estimated from e-Commerce value as well as government e-Procurement. On the other side of the coin, one might look at the size of ICT market as a reflection of intensity. In addition, we put forward the set of indicators on fundamental components to ICT development and knowledge creation. These are research and development and human resources. From the statistics presented, it is obvious that Thailand would need to invest tremendously in these areas as she moves towards the Information Society. To obtain the data for all indicators requires a titanic coordination effort. In this regards, we would like to thank all agencies, whose names were presented throughout the book, who make our tasks much easier. The National Statistical Office, Ministry of Information and Communication Technology, with whom we have jointly worked on a project to develop national ICT indicators since 2003, deserves our special appreciation. We hope that this second series of ICT indicators is beneficial to all readersbeing policy-makers, government planning agencies, market analysts, entrepreneurs, academia, researchers, and general public. We realize that this book is another stepping-stone on a long journey. It will be some time before we can reach a complete database on ICT statistics. NECTEC is proud to be one of the main contributors to materialize that goal in the future.